Alright, so I got my TrackIR 5 and track clip pro through the mail yesterday. It takes some getting used to but I can see it being very helpful in FSX and ArmA II once I get used to it. First problem, one of the status leds (green light on the side) Just stopped working after half an hour of being plugged in and used... It's the one on the right when I look at it, facing me from the top of my monitor. Should I worry? Can I live without it? What does it mean? Second problem, which I hope is not related to my status LED problem. My device tracks my TrackClip Pro up to like 90 even 100 degree (Raw) when I turn my head to the left. The problem is that when I turn my head to the right, and I pass 40 or 50 degrees (Raw still). It indicates that it's still tracking but it completely flips out the view bouncing all around in all of the 6DOF, I see my virtual head just moving every which way. So what's the problem? Is it related to my LED problem. I put it so that I don't have to turn my head over 40 degrees raw to make it 180 degrees in game. But I still don't want something that's working at 80% it's capacity. Especially when I paid over $250 for it. The right green LED status light, when on, indicates that a TrackIR Enhanced game is connected to the TrackIR software. It should be off if a game isn't running alongside the software, but if it doesn't turn on when a game is connected, there is a problem. It isn't *essential* as you can still determine that a game is connected by looking at the top left corner of the TrackIR software ("Title: ArmA 2" etc...). But, it should be working. Your second problem should not be related to the LED issue, and it should not require a return of the camera to address. It sounds like it could be a camera placement issue. Is the TrackIR camera positioned on the left side of the monitor (as it faces you), to take the TrackClip PRO's offset position into account? 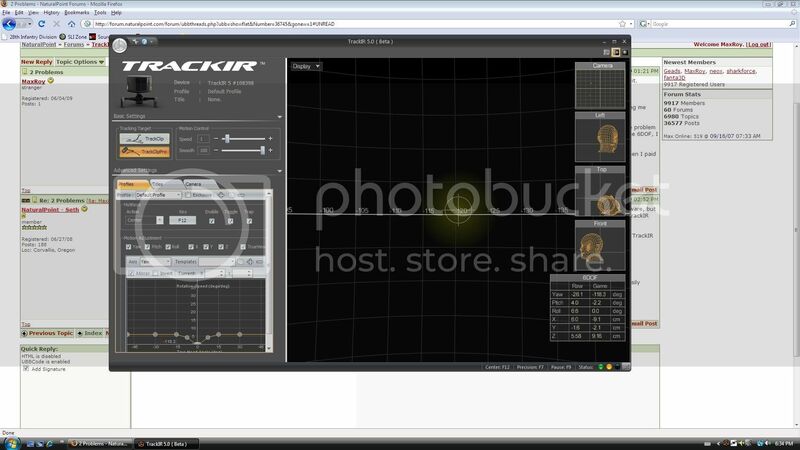 Can you take a screen shot of the "Camera View" in the TrackIR software with the TrackClip PRO on and your head in a comfortably centered position? By the way, what do you mean when you say "raw" movement? Are you referring to your actual physical head movement? When everything is properly positioned, TrackIR should be able to track markers on the TrackClip up to about +/- 50 degrees of actual head movement left and right. This should easily translate to up to +/- 180 degrees of in game movement with the default profile. I realized a bit after posting that my Status LED are working perfectly fine. Was ignorant to their function. As for my second problem here it is. On the default profile, I haven't tinkered with it, when I look right pass the point of my view in the screenshot below, the tracking goes crazy and bounces all around, but looking left on the same profile I can look way pass that same on the left without it bouncing all over the place. Oh, and yes, my TrackIR camera is offset to the left and centered with my trackclip pro. Looking at your screen shot, the green blobs are displaced to the left. You should be able to see 180 R and L with very little movement of the blobs from center if you are lined up correctly. I sit at around 30" from my monitor. My feeling is that you need to do some fine tuning on your positioning. The blobs should be vertical (2 anyway) and centered on the Y (pitch) axis when you press 'center'. I agree with meditek. When everything is positioned correctly, you'd like to see the three dots relatively centered in the camera's view. Additionally, I think you'll really benefit from dropping your smoothing significantly. Try it around 30 or 40. (I prefer around 10-15.) With your smoothing at 100, you're probably getting some delay in tracking, which might cause you to overextend your head to "force" it to speed up, which would exaggerate the problem. Well I played around with it, and I still have the problem turning right too far. So I set it that I can use fewer degrees turn, still weird that it does that. I am sitting between 25 and 35 inches from the device and make sure it's centered. It doesn't affect my gameplay much, just aggravating to know, that for some reason I can turn my head a lot farther to the left without hectic tracking then I can to the right. It doesn't make sense.